This is a must for building any Johnson/Evinrude hot rod project. We have spent the last 5 years working diligently with a team of brilliant engineers at Wiseco developing a quality piston we race and are now proud to share with you. These are world championship quality parts no longer hidden in our own private stash. We have made over 1000 dyno pulls and won 4 world championships using these pistons with zero…I mean zero problems whatsoever. Prior to this we went through pistons like gasoline. 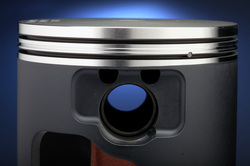 A properly tuned DBR piston will stand up to a 200 plus hp nitrous blast. You can integrate these into your porting design using stock sleeves or couple them with our drop in DBR sleeves and have the potential of an easy 450 hp. These two items are a perfect marriage for the best of both worlds. They produce huge torque and extremely strong over rev. We suggest pairing the two together for best performance. This combination is a winner. Note: All DBR pistons come with a 97 gram tapered wrist pin. Click here for more Technical 101 information! We are currently out of stock of the DBR 3.0 liter piston. Designed for F-1 racing , we have a very unique forged finger port design. A well built 3.0 liter can make upward of 450 hp and turn over 10,000 rpm. These share all the same features of the 3.3 liter piston. If you are interested in a 3.0 liter high quality forged piston, please call as a minimum run quantity is required. If enough of you are interested, we can produce a run.